As if the edit features recently introduced by Google which lets you modify a marker for specifica places that you happen to know was entered incorrectly is not enough, Google is adding a new feature which will make things easier. Starting today, Street View is now part of the handy reference that you can use when editing place markers on Google Maps. This means that if you see a place marker which was incorrectly placed on Google Maps and you want to edit it, you can now use Street View to take a closer look at a particular place. Of course this will lead you into mark a specific spot better and more accurate since you are actually marking the exact spot as displayed by Street View. By introducing this feature, Google is encouraging Google Maps users to mark places at the entrance of the place and as much as possible avoid marking in the center of a street block. This can now be easily done through the Street View. But this is applicable only for places with available Street View. As you all know not all the known places mapped by Google maps would have corresponding Street View. In this cases, the marker can still be placed at the center of a block. So, in case you find a specifically marked spot on Google Maps which you believe is incorrect you can edit this by clicking on the marker to display the infowindow. Click on the “more” link and then click the “Move marker” link in the drop down menu. 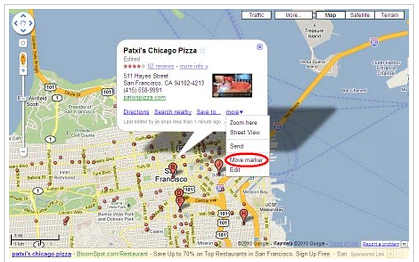 Then you can drag the marker to the right spot on Google maps. Pretty cool, right? So, have you used Google Maps before? Do you find the place markers useful or utterly useless?